A few days ago I blogged about the client who wanted to surprise his wife with a beautiful balcony. And I showed you the first of 5 great containers. Click on the image to get a close up of the under plantings. The sweet little Chamaecyparis pisifera–Golden Threadleaf Cypress. It doesn’t have a variety name, but I’m guessing “Sungold’ or ‘Golden Mop’. The tag says it can grow to 10′, but maybe in 20 years or so! 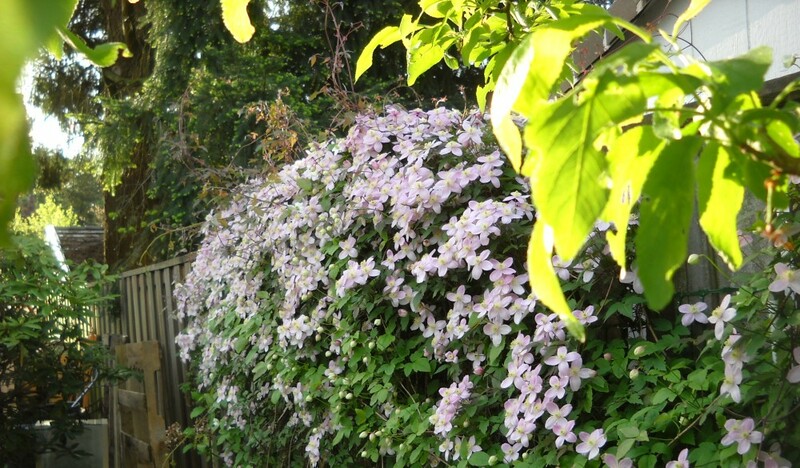 It can also be pruned to stay within it’s container limits, and still be an underplanting. Next is Sisynchrium ‘sapphire’–Blue-eyed grass. Being a cousin to Iris, this will also want a good amount of water. It’s supposed to be a spring bloomer, but there are actually buds on these little guys. Then one of my all-time-favourite plants, a Heuchera, in this case H. ‘Stormy Seas’. I was hoping to buy one of the purple ones that I knew would be sun-tolerant for this south-facing balcony (‘Obsidian’, ‘Purple Palace’, ‘Georgia Plum’) none of which were at the nursery that day. So I risked ‘Stormy Seas’. Now I find it on a list of “shade tolerant heucheras. 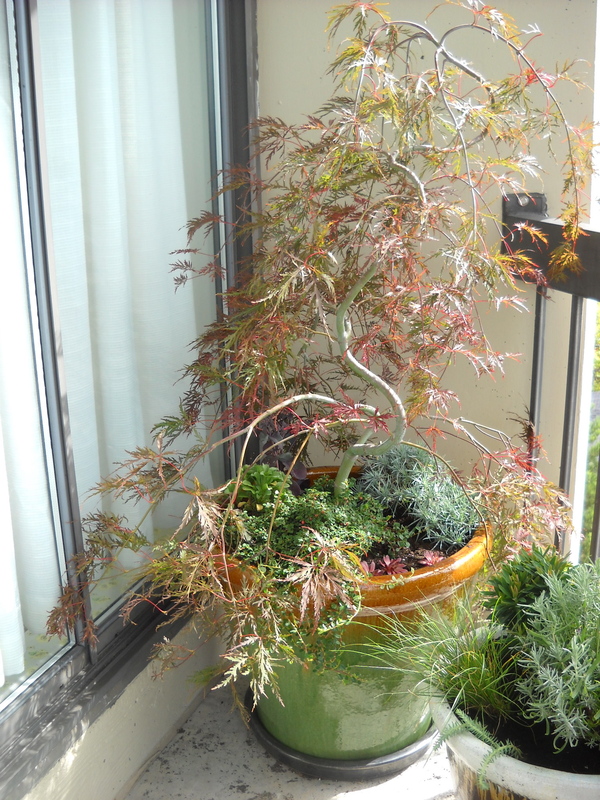 But you can see it’s positioned at the back of the planter, slightly shaded by the plant in front, under the overhang of the balcony above it, and in the shadow of the wall to the west of it. So should be OK.
And finally another favourite, Sedum telephium ‘Xenox’–one of the tall sedums, in this can a real plum colour with just-about-to-bloom pink flowers. There’s one tiny red Sempervivum (“Hens and Chicks”) in the front, rescued from the succulent pot. They multiply like rabbits (or chicks), so one will be many by next summer. This is a formula you can take to the bank, I guarantee it. And of course, as always, would love to get your comments, questions, concerns, even rants–nicely please. 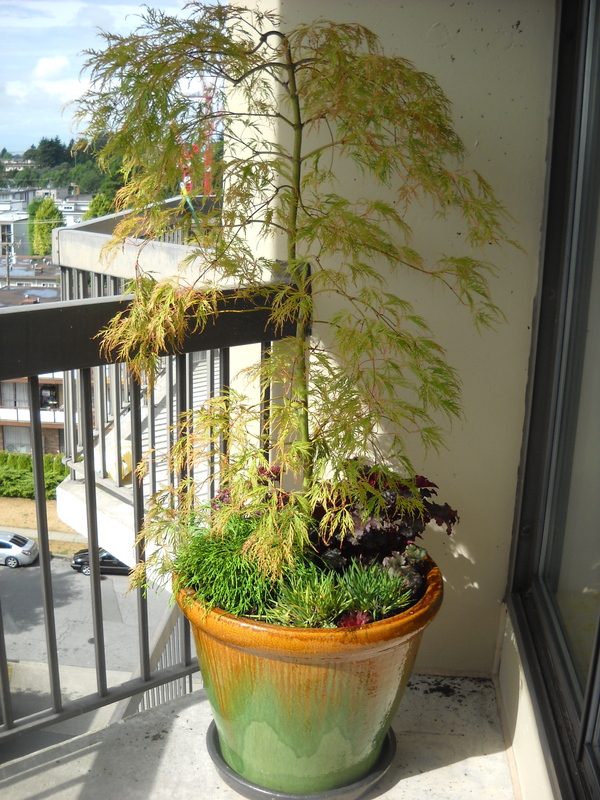 This entry was posted in 5 Things, Balcony, container garden, design and tagged acer palmatum 'viridis', balcony, chamaecyparis pisifera, containers, heuchera 'stormy seas', japanese maples, planting formula, sedum telephium, sysinchrium 'sapphire' by Janet. Bookmark the permalink.